Are you wondering what Pilates is? Most people ask... "is it a bit like Yoga?'. Well the answer to that is yes and no! Its definitely not a Yoga class but you may find some similarities in some of the moves. Have you ever heard someone say... "well i tried Pilates and it didn't do anything for me". As teacher we hear this quite often. The reason for this is some UK Pilates has been far removed from the original work and has found its own market as contemporary style Pilates. The work is often modified and the traditional elements can be lost, and you are most likely to find these classes in a leisure centre or fitness club, bringing a more freestyle class or 'Fitness Pilates' which is more like Body Conditioning. The work is delivered by education centres to students in a skeleton style and if you haven't tried a classical class how would you know the difference? As a teacher working for nearly 20 years and having trained in contemporary and classical Pilates, the studio I opened in 2007 is a very different studio to what it is today. The classical/ authentic workout is formatted and the client is developed through the stages, being directed by the teacher on their own body type, considering any injuries and their abilities. This way the client is performing repetition and the muscle memory has a greater chance to develop, the brain can adapt and the movements evolve, thus progressing, recovering from injury and re-educating the posture at a much quicker rate. The format works through the body in a specific order on purpose. The transition provided my clients with better results and it was a very positive move for me as a teacher, although I still have my tool kit of contemporary knowledge available when I need it. A well trained Pilates teacher would of spent a minimum of 600 hours of teaching and practicing on the Mat and Studio Equipment in order for them to get qualified and start teaching clients, the anatomy is learnt in depth and a deeper understanding of the practice is required in order to see a wider picture when working with each client. Its more than just teaching a few exercises with one size fits all. 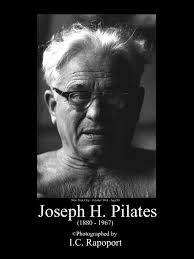 The exercise regime 'Pilates' was created by a man named Joseph Pilates, otherwise known as Joe. 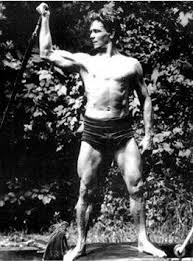 Joe Pilates was born on 9th December 1883 in Germany, so his methods are quite young compared to other methods such as Yoga. Joseph was a fairly sickly child suffering from asthma and rickets, and at the age of around 5 he lost the sight of his left eye. He became fascinated with the human body at a young age and would spend time in the woods to watch the animals move and studied both eastern and western forms of exercise such as Yoga, Zen and ancient Greek and Roman regimes. By the time he was 14 his body had developed well enough to be modelling for anatomy charts. In 1912 Joseph travelled to England with his brother Frederick, to further his training as a boxer and whilst there they found work as touring circus performers as Roman Gladiators. In 1914 the first world war broke out and Joseph was taken in as an intern in England with other German nationals. He continued to work on developing his method of physical conditioning, designing specific exercises to strengthen the entire body with emphasis on the lower back and abdominal region whilst at the same time incorporating flexibility. He started to work with his internees, maintaining their health and keeping them strong and alive through an influenza epidemic. The Pilates method of exercise over the years has been deemed as a woman's exercise class, yet this is not where it began and this information is totally misleading. Pilates, which used to be known as 'Contrology' was originally designed around the male body. Towards the end of the war he worked as an orderly in a hospital on the Isle of Man working with injured soldiers. those who were unable to walk. He attached springs to the patients beds while he worked on them, strengthening their limbs and helping them move. It was noticed by Joe and the doctors how the recovery of patients began to speed up and this is where the basis for the apparatus began, working in conjunction with his Mat work format. The Mat workout is the original workout system, however through development the Mat assists a client on working with Equipment and the Equipment helps clients to work better on the Mat. 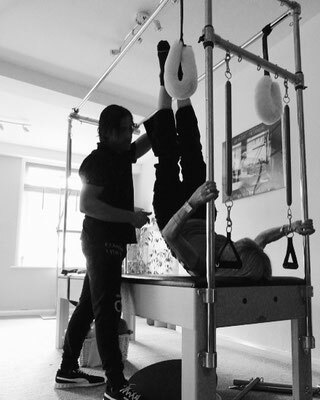 Pilates Equipment was developed by Joe for his method, and only through design and patenting has it changed slightly, newly designed straps or springs, adjusted models. Most of his pieces include springs, providing the client with resistance or assistance whilst exercising. Some of these models are used in our studio, such as Reformers, The Cadillac, Barrels, Chairs and some small pieces regularly used also include hand weights and the toe corrector plus the Mat work exercises. His work was continued by the clients he taught, they continued to teach the method and passed down the work of Joe the genius. These people were called 'The Elders'. It was Romana Kryzanowska who extended herself, carrying the torch for Joe, sadly she is no longer with us, as some of the other elders but a few of them are still working at a good age with the magical tools and knowledge they gained from such an incredible lifetime opportunity. At this time we are still able to learn from a few elders and 1st and 2nd generation teachers who hold such value in the industry to keep Joes work alive and true. Pilates works on balancing the body, providing even muscular connections and stabilisations through the body, conditions and realigns the spine and works on the centre muscles of the body providing support from head to toe. This creates less stress on the joints and the body as a whole, so as we go about in our daily lives we feel more flexible and able to carry out the tasks we love to do and help to prevent us from injury. At The Body Suite, our knowledge and expertise provides us with the tools to guide clients through a safe and highly effective workout. Here are some of the reasons why clients come to see us. If you have any questions or would like to chat with us then get in touch with us, we would love to hear from you.